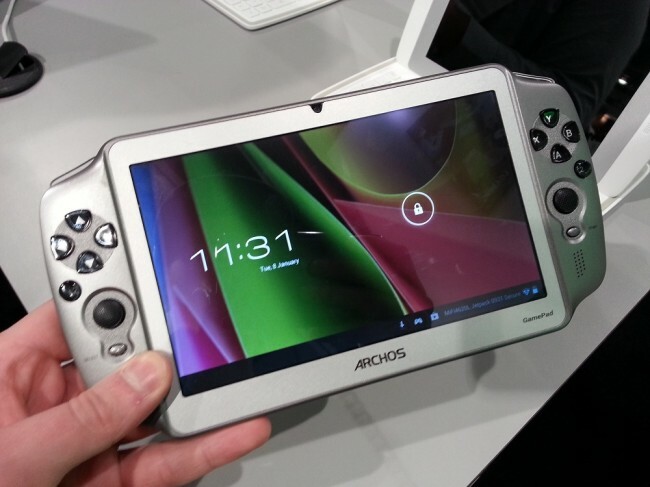 We just got done hanging with the ARCHOS crew here at CES, and while we were there, we were able to go hands-on with the brand spanking new GamePad. The device sports built-in buttons, triggers, and toggles, all dedicated for gaming centered around a semi-okay display with a resolution of 1024 x 600. The hybrid device is powered by a dual-core processor, quad-core GPU, 1GB of RAM, and 8GB of on-board memory which is expandable. It is now available here in the U.S. for the price of $169, which is actually quite reasonable, given ARCHOS even built their own key mapping software that works like a charm. All in all, it is a neat little device that kids would probably go crazy for. The toggles were a bit cheap feeling and the display isn’t close to HD, but it meets a very low price point that Project SHIELD from NVIDIA will likely come no where near. Check out our hands-on with the GamePad down below.